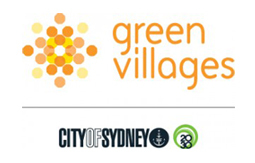 The City of Sydney’s Green Villages program features bright ideas for a sustainable Sydney. Discover green tips and the latest sustainability news, join a community garden, apply for a grant, foster Sydney’s local biodiversity or attend a free sustainability workshop. 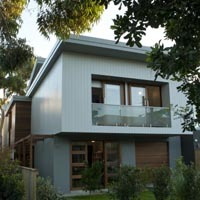 Sydney-based AMBER ROAD is an interiors and landscape design studio that creates solutions sensitive to the brief of each client, responsive to the unique character of each site, and, wherever possible, linking inside and outside spaces. We believe the heart of ‘sustainable’ design lies in creating engaging spaces that are artful, flexible to adapt the ever-changing needs of our clients and the market and, most importantly, make you ‘feel at home’. 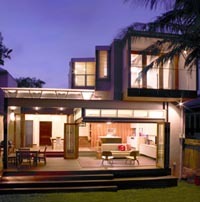 Anderson Architecture is a small firm specialising in projects from inner city terraces up to new homes. 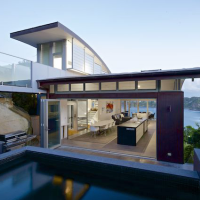 We are passionate about sustainability with architectural integrity and offer over twenty years experience coupled with the use of technology such as thermal modelling and 3D imaging programs. This enables us to offer clients holistic solutions, empowering them to decide what’s best for their situation. 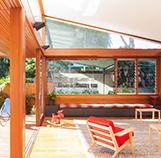 We work with the clients brief in a collaborative approach to produce human, comfortable, contemporary environments that greatly reduce impacts on our environment. Archisoul Architects and Consultants are a team of Architects, Interior Designers and Sustainability experts who are passionate about the health of the planet and it’s inhabitants. Directors Sue Connor and Jo Gillies have had their own practices for over 22 years and have partnered to form a team that is able to focus on our passion of producing inspiring, ethical, environmentally conscious solutions. We design with a holistic and integrative approach to the landscape and our knowledge of building biology ensures our interiors are healthy spaces to live in. 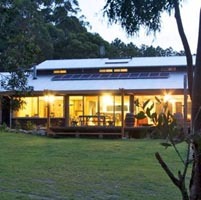 Australian Living specialises in the creation of truly sustainable homes via our unique Sustainable Fusion service that fuses sustainability into every aspect of design and construction. Our customers enjoy living in their energy efficient, natural, healthy and comfortable homes that didn’t cost extra just because it is sustainable. We work to a simple and powerful philosophy – push the boundaries and go beyond the call of duty. Rising energy costs and the sustainability of our planet are issues which are very closely linked and affect everyone, everywhere. Together these two issues have prompted governments, large and small businesses, and individual home owners to become more conscious of the environment we all share and the energy we all waste needlessly. 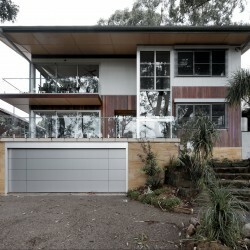 With this thought in mind, our goal at David Baillie Architect is to seamlessly combine innovative design with outstanding energy efficiency to enhance lifestyle, save money and help protect our environment. 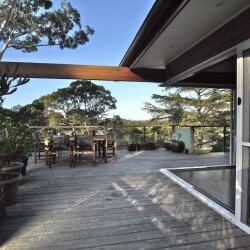 Eminè Mehmet is passionate about making sustainability easy to incorporate in your home. 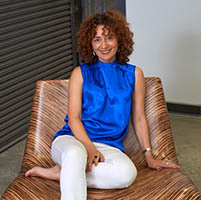 She is an Interior Designer, Global Sustainability Ambassador, Writer, Speaker and Product Designer as well as being an Ambassador of The Foundation for National Parks & Wildlife, a Green Star Accredited Professional and Fellow of the Design Institute of Australia. 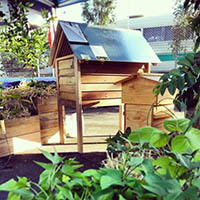 Gordon Williams heads up Free Range Food Gardens and believes that the time has come for fruit trees, veggie gardens and even the humble chicken to regain a place in gardens wherever people live, from the quarter acre suburban block to inner city courtyards. Using ecological design principles Free Range Food Gardens create gardens that make the best use of water, soils and sun available at each site to grow an abundance of nutrient dense and healthy food that is full of flavour. 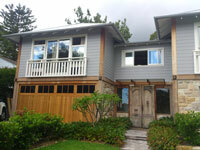 Greener Kitchens has been designing environmentally respectful kitchens for the past six years. 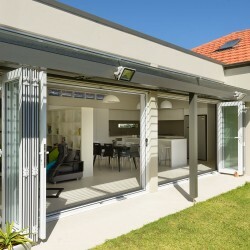 Our passion is to put a bit of love into our work, responding intimately to the needs and wishes of our clients and very carefully selecting materials that make for healthier homes and a healthier environment. We care about where things come from, what is in them, how long they are going to last and where they are going to end up. 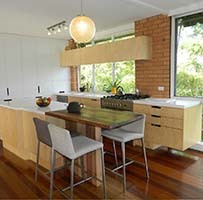 Greener Kitchens will be represented by designer Druce Davey, who has spent the last two years working with Jamie Oliver to design greener kitchens for his inspirational Ministry of Food Centres around Australia. At Ian Sercombe Architect our aim is to create buildings of a contemporary style that respond to their site and environment. 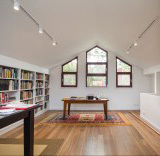 We blend our design skills with an extensive and hands on knowledge of sustainability in all our projects, including new homes and alterations and additions. We understand that a building affects the quality of life of its users on conscious and subconscious levels, contributing to the health, creativity and well-being of the occupants. 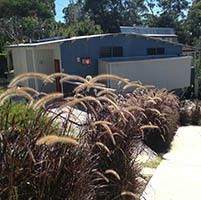 Lucy Sharman is the former Senior Project Officer, Green Roofs and Walls at the City of Sydney. She has been a sustainability educator for many years and has turned her expertise towards specialising in green roofs and walls. Green roofs and walls not only add beauty and value to your home but they also benefit the broader community and our environment. 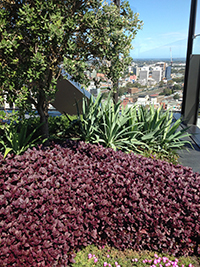 Lucy will be able to provide you with advice on the sorts of green roof or wall designs which may suit your particular needs as well as tips for getting the most out of your green roof or wall. 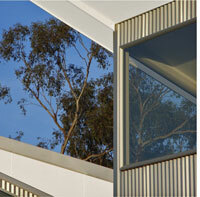 PIDCOCK – Architecture and Sustainability is focused on desirable, sustainable architecture. 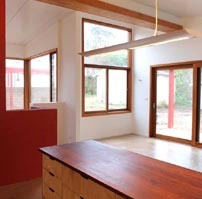 Our practice aims to excel in ecologically sustainable design, documentation and advice. We aim to demonstrate how the many issues that are integral to such architecture can be potent influences in design and can produce delightful experiences. We like to work collaboratively with our clients, consultants and builders from the start of every project to enable the outcomes to be enriched by the group’s collective experience. 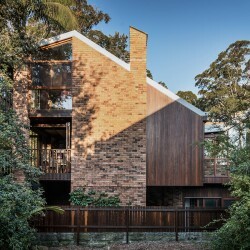 After completing undergraduate studies in environmental design and ecology, Chris Reardon spent 25 years as an accredited building design practitioner and licensed builder in NSW and Qld. 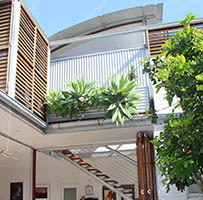 His multi-award winning practice, Suntech Design, specialises in sustainable built environment solutions for Australia’s diverse range of climates. 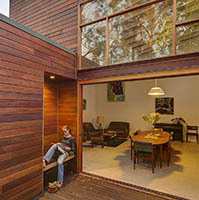 Chris’s recent PhD focused on sustainable change creation in the Australian Housing sector and he is the principal author of the Your Home sustainable design guide. Steve Batley’s innovative designs make it easy for city folk to experience the joy of growing and eating organic food from their own beautiful abundant garden. 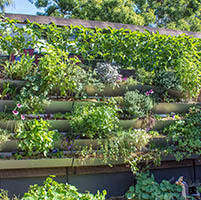 A landscape architect, permaculture designer, organic gardener and educator, Steve’s own garden is full of chooks, veggies, herbs, fruit trees, compost, vertical gardens and aquaponics. He’s empowering individuals to transform their space, making cities productive and green via innovative landscape architecture firm Sydney Organic Gardens. With over six years in sustainable design experience, we have the ability to enhance an existing building or start from the beginning. YESsammassey provides design and consulting services to produce innovative, cost effective and sustainable solutions tailored to individual needs.